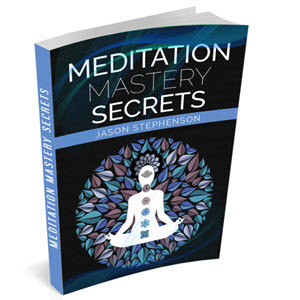 After mastering the concentration exercises and gaining control over your attention, you are ready for meditation. There is a contemplative stage between pure concentration and deep meditation that you might experience. It isn't necessarily detrimental, but it is the point where you can hallucinate and relate what you think are mystical experiences. You should be very wary of visions encountered while attempting meditation. You could be easily fooled with false notions from this curious limbo region between hypnosis and meditation. Just observe, proceed and experience any visions encountered, without judgment. Actual attainment of meditation occurs when you are able to focus entirely on one item, and then remove the item from your mind and become attuned with the universe. It's not making the mind go blank, but allowing it to go empty that creates this experience. Then you feel like you become one with everything and in control of your total being. In one way or another, you spend your entire life trying to find this web of kinship which joins you to all living things and to Universal Love. Finding it, you realize then that the Kingdom of Heaven truly IS within you. Meditation is an upper brain exercise that allows a person to experience the exalted higher emotional feelings so long sought after - selfless love, compassion, happiness, bliss, etc. After getting accomplished at experiencing these feelings, the adept can consciously recreate these emotions in his everyday life even without a formal meditative rapport. For beginning meditators, the simple exercise of observing and attending to your breathing is a good one. Choose a quiet place and assume a comfortable position in a chair with your spine erect. 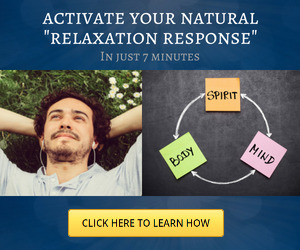 Relax, close your eyes and bring your conscious awareness to the rhythm of your breathing. Say to yourself, "I am mindfully aware of breathing in," and then "I am mindfully aware of breathing out." You don't even have to recite the whole sentence. Just say, "breathing in" and "breathing out," to keep your mind on your breath. Notice the rising and falling of your abdomen as you breathe. Let your body become still while you inhale steadily and slowly. Feel the flow of your breathing. Notice how each breath cleanses and nourishes you. As thoughts intrude upon your consciousness, allow them to come and go without giving them further energy. Just witness the thoughts and bring your awareness back to your breathing. As you practice, you will gradually start to detach from these thoughts and cease your background dialogue. Recognize the changing flow of emotion in you, but don't try to modify your feelings. Know that whatever you may feel is part of your flow of experience, and not a permanent state of your personality. Gently move back to following the movement of your breath. Keep this thought in mind as you meditate, "God is present, loving me as I am, and guiding me." Realize the truth of this statement, and open yourself to it, but do not consider that by thinking it you are accomplishing anything. After a while, this thought will be in the background of your experience without actually articulating it very often. The length of time you meditate in the beginning can be as brief as 5 minutes several times a day, but gradually you will find yourself extending the time to 30 or 60 minutes in one sitting as you discover the inherent benefits. There is also the meditation on a sound that you generate, called a mantra. Some basic mantras are: ram, lam, ham, yam, aum or oom. After choosing a mantra sound (or other word sound you prefer) that intuitively feels right for you, resonate your mantra with utmost concentration in rapid repetitions for as long as one breath will allow. The resulting sound vibration sets up wave patterns throughout your cellular tissues that stimulate and harmonize your whole body. You can also reiterate your mantra mentally in the same repetitive way during each exhalation. This is good during potentially stressful moments throughout the day. After awhile, you'll find it will reverberate on its own in your mind without a conscious effort to repeat it. Devotees to transcendental meditation (TM) have displayed increased alpha and theta waves as well as a decreased blood pressure, heart rate and oxygen consumption. Correspondingly, this also promoted better relaxation and reduced anxiety during their normal day. Another meditation exercise is focusing your attention on the inner sound in your ears. You can perceive this subtle sound in the quiet of your own home. Sufferers of tinnitus hear this inner sound in their ears (generated from the cochlea of the inner ear) as a loud pathological noise. You can also meditate on the inner light in your head by closing and raising your eyes to concentrate on the 'third eye' point in back of the bridge of your nose. (Like when used in self-hypnosis, this physiologically enhances an altered state of awareness.) When you do this, you'll begin to see a speck of illumination. As concentration continues, the point of light expands gradually into your whole field of vision. Then veil after veil of vibrational light reveals itself until finally spiritual vision is achieved. Some meditators initiate the process of seeing the light by imagining it at first or by gently pinching their closed eyelids & producing a phosphene effect. Buddhist meditation involves 4 primary posture positions -- standing, walking, sitting and lying down. In each posture, you become mindful about what you are doing as you are doing it. For instance, with your eyes closed, bring your awareness to the act of standing and reiterate internally, "Standing, standing, standing," over and over to yourself as you stand quietly with your hands in front of you. When doing the walking meditation, walk very slowly forward and say, "Left ... foot ... touch," then "Right ... foot ... touch," etc. Then turn around slowly and say, "Turning, turning, turning" etc. By being mindful of each step in the process, your focus is brought totally to what you are doing as you are doing it. The same procedure is followed with the sitting and lying down postures, and for all other daily acts -- eating, driving, working, etc. By becoming as conscious as possible throughout your day, you achieve the meditative purpose and all its benefits. In fact, it has been shown that crime is sharply reduced in the immediate vicinity of a group of consistent meditators. Beneficial health effects are also prevalent amongst meditators, especially in the relief of stress and its corresponding related diseases. Like all skills, meditation takes practice to derive its ultimate benefits. The more you practice it, the better you get at it. Even beginning meditators will benefit though from a growing peace, calmness and relaxation within their inner being. When you realize that nothing is outside and everything is within yourself, then you can transcend the limitations of space and time. This is the Self or God realization that the Eastern philosophies speak about. This is when there is no difference between knower, knowledge and known or between the future, past and present -- the eternal "Now."